James Crane has quickly been snapped by one of Bognor's big rivals after deciding to leave Nyewood Lane - he has signed for Worthing. The full-back, who can also play in midfield, has been recruited by Adam Hinshelwood for Worthing's push for promotion from the Bostik premier - a division in which he will face the Rocks next season. Crane had been at Nyewood Lane for a decade but had decided in the past few days he needed a new challenge - leaving many Rocks fans upset to see another fan favourite leave. Crane, 28, who works in Worthing as a teacher, told his new club's official website: "I felt I needed a change, 10 years is a long time at any club these days at any level. My aim was to get the club back to the National League South which we achieved last season, but the club is changing and I decided my future was away from Bognor. ‘When my release was announced, I had a few offers, clubs phoning me. I know Adam (Hinshelwood) well and I wanted to play for a club who want to progress and win things. This club is very much a sleeping giant, it’s a perfect fit for me, the professional feel around it is something that works. "I watched a lot of Worthing games last year and I’m confident I can fit in well to the team and contribute something. I’m close to Darren (Budd) and Alex (Parsons) from their time at Bognor and chatting to them it made me feel this is somewhere I want to be." 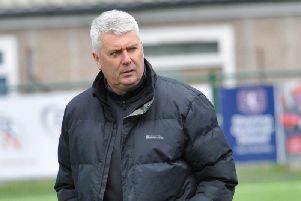 Crane told www.worthingfc.com he was confident the team would feature at the right end of the table this time around, after some struggles last term: ‘I believe this club is set up ready for the next level. It’s all about getting ourselves into those play-off positions with a good start to the season, stabilise, then push on and get away from the other teams around us, I’m ready to be a huge part of what can be achieved here."